For three months, I trained three times a day. I invested my time and money, bringing training partners from Brazil and other countries, to do the best training camp of my life so I would be ready to defend by belt for the eighth time on July 11. Unfortunately, I fractured my rib during a training session, which I can prove from an official medical report, and besides trying my best to fight, I was forced the other way and that made me really sad. Only I, my family, coaches and teammates know how hard I worked to represent Brazil again. My decision was made in respect to the UFC and the fans that today see me as the best pound-for-pound fighter in the world. I couldn’t fight without being 100 percent physically and with a rib injury that could get worse if I got hit in the ribs. Many people told me to fight anyway because of the money I could make, but I wouldn’t sell myself for any money, no matter how much. I fight for love and I do it for my country. Money comes in second place, it’s like a shadow: when you try catching it, you can’t, but when you move forward, it follows you. Money ends some day, but legacy and things you do becomes part of the history, and that’s what I value the most. 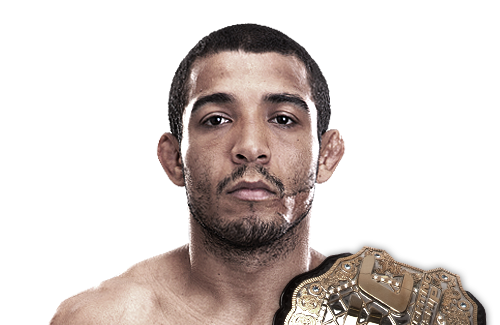 I’m the UFC champion since April 2011, defended my belt seven times in four years, and will do it for the eighth time in 2015, an average of twice a year. And I’m not even mentioning WEC, a Zuffa-owned company, like the UFC, where I became the champion in 2009 and put my belt on the line twice in less than a year. That why I can’t agree with UFC’s decision to have an interim champion in my division citing the five opportunities that I couldn’t defend my belt. If those fights had occurred, I would have done 12 title fights in four years in the UFC, an average of three fights a year, something that no other UFC champion did. A UFC champion rarely does three title defenses in one year. So that can’t be the main reason why they are creating an interim title, but the UFC is a private company which I work for, so I can’t complain about its decision, but I can’t say I agree either. As of my opponent, who told me to step up and fight like a man, I can’t say anything about a man that imitates a TV series character (Travis Fimmel, from Vikings). That’s really who he wanted to be, because he’s probably ashamed of being who he really is, so he imitates his lines, his style and this actor’s tattoos. He’s an artist, but not from martial arts, but cheap comedy. It’s disrespectful with the actor, and with real athletes. He should look for a stage and not an Octagon. The Octagon is my kingdom and there’s place for only one king, which is me. If he wants to participate, he can be the joker he already is. If he beats Chad Mendes, the only thing he will have is a toy belt to show his friends, drunk in his country’s bars, because that’s what an interim belt represents to me: a toy. I am the champion.